Well, this post was a long time coming! 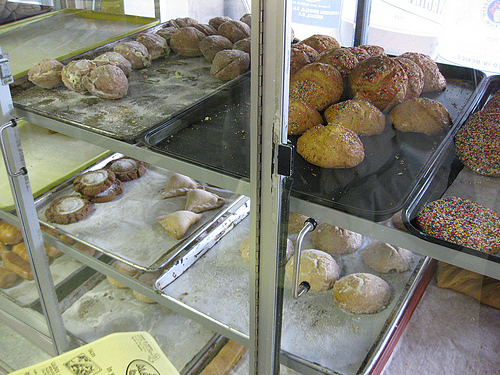 Monday afternoon we finally got a chance to check out the newly expanded San Marcos Grocery with a fully-functioning dining room. 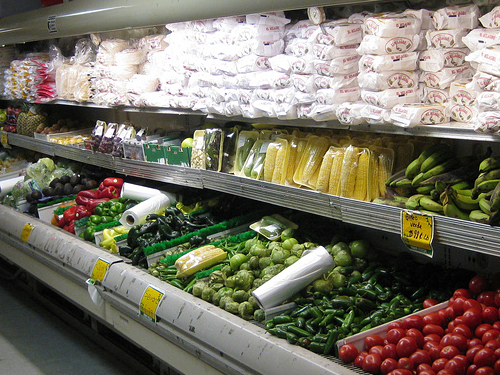 I have a feeling several of you are San Marcos cult-members and will henceforth reminisce about a small counter in the dim lit corner of a little grocery store. 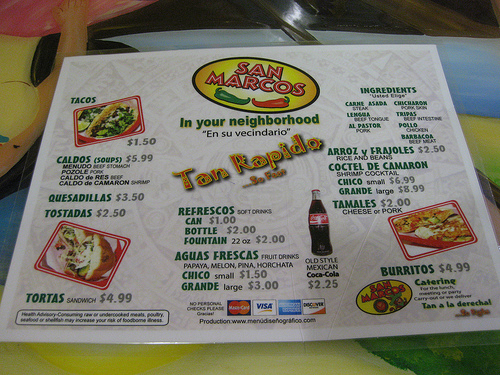 San Marcos has gone through a growth spurt… simply walk all the way through the far back archway to enjoy the same, best tacos in NW Ohio. 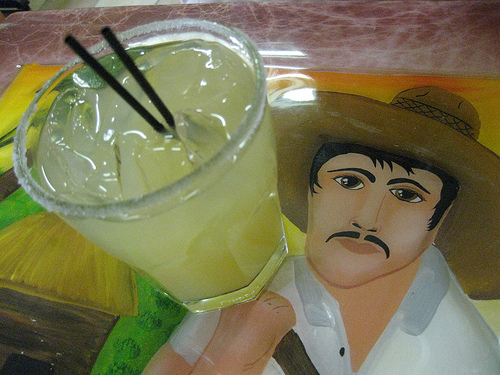 It was after 5pm so a couple margaritas were tossed at us–with salt, please! 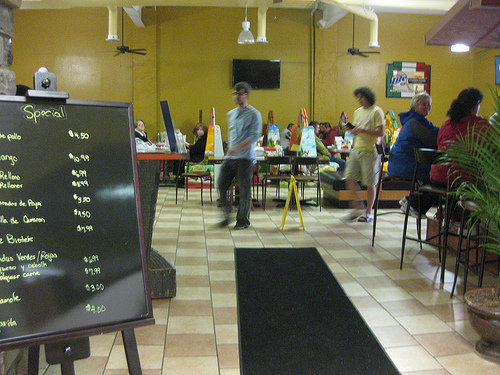 The tables and booths are covered in colorful paintings and relief art. Of course we ordered too much food (leftovers!) and D.’s dishes came out first. 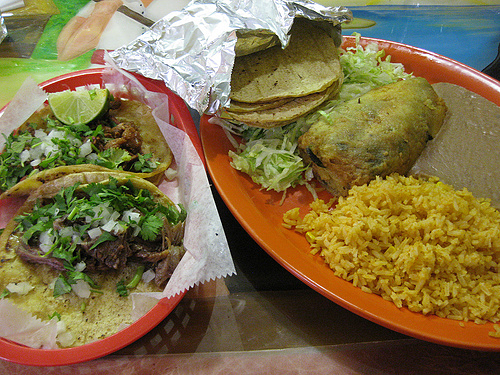 A beef tongue taco (which I find conceptually abhorrent), a pork taco, and a chili relleno. He loved it all. While the dining situation has changed, the food has remained just as fresh and authentic as it ever was. There are bottles of both green and red hot sauces on the tables and I suggest trying both. 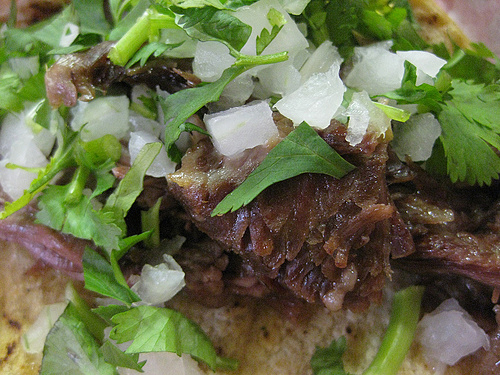 The green hot sauce is a little hotter than the red… the red has a bit of a smokey flavor to it. 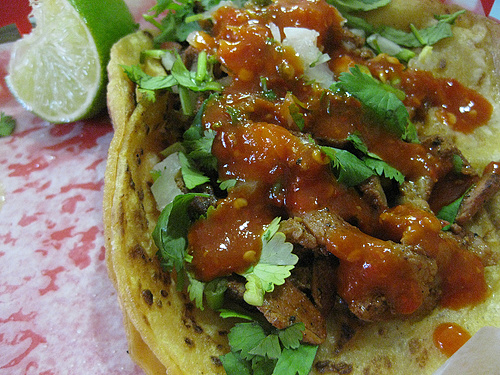 Both have little to no vinegar taste which is common in Mexican hot sauces. 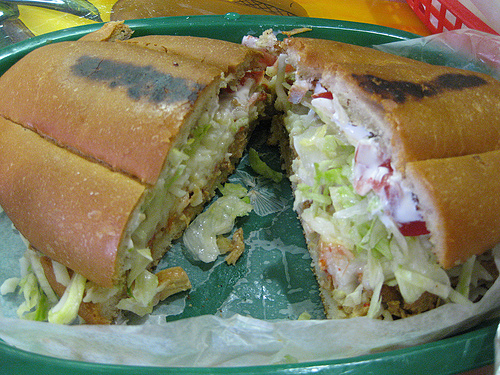 My first “torta” would have been when I lived in San Francisco. This sandwich lived up to my high expectations–prepared with chicken, melted cheese, roasted peppers, tomato, lettuce, and avocado. The mayo-looking dressing was not mayo but more of a creme fraiche. It was a delicious dine (n.-yes I’m using it as a noun), huge (half went home in a box), and cheap. Afterwards we spent a few minutes in the actual grocery store, which is always an adventure. We not only left with satisfied and very full tummies but also brought home some perfectly mysterious patries.